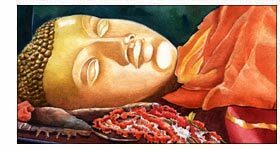 Buddha is ingrained in the spirit of India and Nepal. A spiritual philosopher and sage of all sages, Siddhartha Gautama Buddha was born in Lumbini, Nepal and spent his whole life in North India in search of his lifes motive. In his late 20s, he witnessed the four great signs in the form of an old man, a sick man and a corpse and a meditating ascetic. These four sights changed his whole vision of life and he renounced his material wealth for ultimate enlightenment. He meditated as a monk and fulfilled his objective of gaining enlightenment in Bodhgaya. 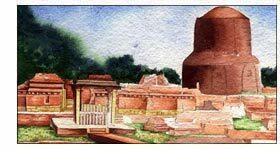 He continued the journey towards Sarnath near Varanasi where he preached his first sermon to the first five followers. He continued doing this for the rest of his life before he released himself from the consecutive cycles of birth and death in Kushinagar.fe. The above mentioned sacred locations in India and Nepal have now become the prime Buddhist worship places the world over. Every believer of Buddha keeps it as a lifes mission to visit the Buddhist-Pilgrimage sites and follow the spiritual master to gain the merit of living on earth. To fulfill this purpose of life, the pilgrims visit Lumbini in Nepal (birth), Bodhgaya in Bihar (enlightenment), Sarnath (first-sermon) and Kushinagar (final mahaparinirvana) in Uttar Pradesh, India as a part of the Buddhist-Pilgrimage. This fruitful journey of life brings pilgrims close to the Buddhist places of worship in India and Nepal. During this sacred journey, the believers can gain merit of travelling with the fellow Buddhists and monks to embrace the spirit of learning as established by Buddha. Discover the places where Buddha realized his meaning of life with Buddhist-Pilgrimage. Suggested by Sakyamuni himself, this sacred journey of a lifetime brings the soulful motive of existence in life.